Straightforward, stylish, authentic, tasteful and just the job. It’s not surprising that the tableware and kitchen tools you’ll find in Leo’s Deli have so much in common with our own classic homemade food creations. From shiny silver cafetière sets to Scandinavian ceramics and food smoking kits, or darling coffee cups and cheese cleavers to easy-to-grasp graters and beautiful olive wood bowls, our homeware selection is small, but perfectly formed. Based on our experience ‘en cuisine’, everything is fine and functional, so look forward to discovering irresistible additions for your own chef-ing space as well as the most fabulous gift ideas for foodie friends. Jansen brings sheer beauty and bright colours to your table all the way from Amsterdam. At times contemporary, vivid and original, but also offering subtler tones and a certain softness of touch, every plate, cup, saucer and coffee pot allows you and your creative cuisine to make a fittingly refreshing and personal statement. As you’d expect from Leo’s Deli team, part of the attraction is that these high quality designer pieces are hand-finished by passionate craftsmen, products of ethical manufacturing in socially responsible factories. Our selection from Finland is to fall in love with too. The simple beauty of iittala’s Sarjaton, Origio and Kastehelmi ranges is quite stunning. From embossed bowls and stripey mugs to fine plates and platters, everything is designed to let food creations discover real freedom of expression. Both a high quality blank canvas and frame for any fine food experiences, these designer pieces work brilliantly on their own or as a set and make lovely lasting gifts for any lovely friends or family. Leo's Deli Framlingham is a purveyor of fine foods and fresh produce from East Anglia and overseas. 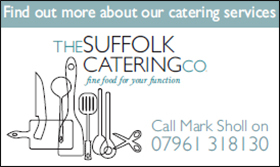 Our Suffolk delicatessen shop caters for discerning food lovers across East Suffolk and the Suffolk heritage coast, offering top quality cheeses, chocolate, artisan breads, pies; buffet snacks, sandwiches for business lunches; charcuterie,ceramics, wines and real ales; gifts for foodie friends and much more.